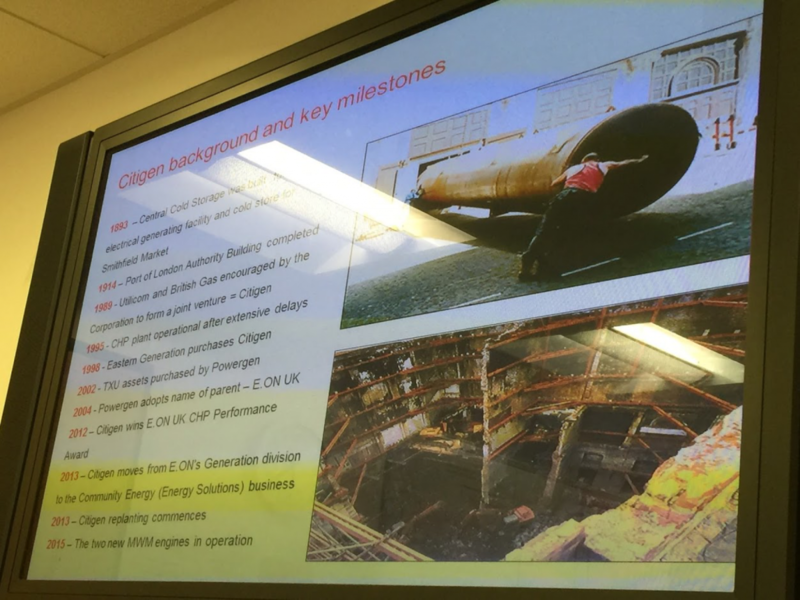 In April 2016, E.ON hosted InterEngineering for a site tour of their Citigen Combined Heat and Power (CHP) plant in London Docklands. Located in the heart of the City of London, Citigen delivers hot water (used for heating) and cold water (for air conditioning) to buildings across London via a 6km heat network and a 4.5km cold water network, as well as generating power for the national grid. E.ON Community Energy recently upgraded Citigen with new modern CHP engines to ensure the site can deliver reliable, low carbon heat to its customers like the Barbican and the Museum of London for years to come. Citigen is also home for E.ON’s 24/7 national district heating control centre which monitors and controls over 33 networks across the UK. 15 engineers joined us on the bespoke tour. The visit commenced with an introduction to the history of the site, the challenges in commissioning the facility and subsequently running it to maximise profitability. After the safety induction and getting suited and booted in PPE, we made our way to beneath the streets of London to see the plant equipment and had the opportunity to walk around situated in the vaults of the 100-year-old listed building and saw first hand low carbon, distributed energy. To finish the evening, E.ON kindly covered dinner for attendees at the nearby local watering hole Smiths of Smithfield. Overall, an enjoyable night was had by all for the first InterEngineering site tour.